Salads are on the menu most days around here, especially in the summer when produce is fresh and crisp. We save time and escape firing up the oven on hot summer evenings by grilling up a bunch of lean protein at the beginning of the week, then whipping up a hearty salad each night for a healthy dinner that’s ready in less than 15 minutes. The other day, we ran out of our favorite dressing (Trader Joe’s Sesame Soy Ginger Vinaigrette), so it was time to whip up a quick vinaigrette with existing pantry items. I wanted something a little more interesting than just oil and vinegar, so I reached for the maple syrup and to my surprise, it was delicious! 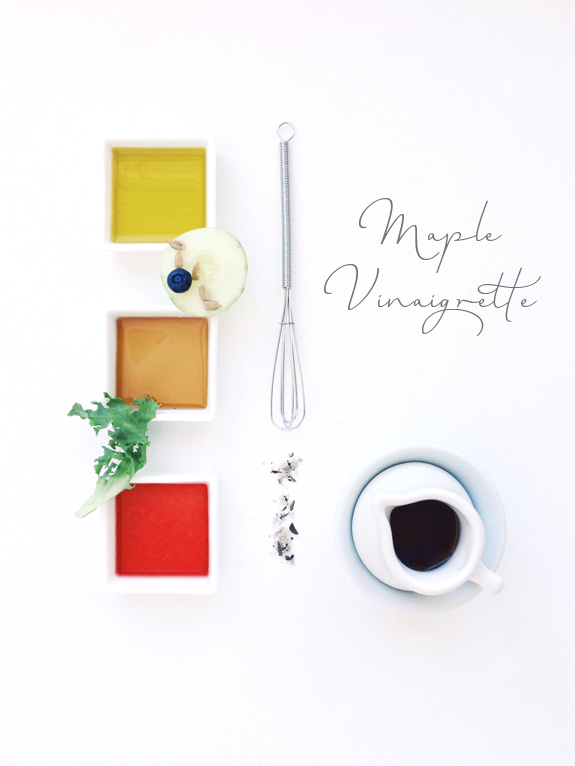 The result was a light and tangy dressing, with just a hint of maple sweetness. Even my fairly picky foodie husband gave it the thumbs up, so with that vote of confidence, I thought I’d share the recipe with you in case you have a salad dressing emergency of your own.